Discussion in 'Current Events' started by Pscholes18, Dec 2, 2017. So I'm an idiot when it comes to all to tax plans/regulations etc....looking or a neutral dumbed down explanation from someone who really understands all of this stuff...I see the articles about how much famlies with different incomes will save. Then I read comments how the middle and and lower classes are really getting fecked over and the rich will be the ones who will come out ahead at the end. What about singles with no kids? How will this new plan affect them? I'm guessing it'll be a bit soon to know for sure. One of the few middle class benefits was the childcare tax credit, so if you are a single male getting most of his income from wages, you get a lump of coal. The bitter part of me wants this tax giveaway to the rich to hurt the working & middle class that voted Trump. Stupid feckers get what they deserve. Sadly though, that'd hurt the ones that didn't too. No surprise the wealthier voted for Trump. Baffling that those that are lowly paid did. This tax bill has the look of a troubling but familiar cycle; republicans drive up the debt & reduce money to the poor and years later the democrats have to fix the mess created. I've noticed that the 50-100k income bracket are consistently the most Republican on all issues, including healthcare, but (IIRC) also on "social" issues like abortion. Similarly, in UK, Corbyn won a slight majority among D and E, was at par with C1, but lost badly among C2. (which I think might track roughly with the categories in that picture?). This right-wing middle class and divided upper-middle seems to be a trend. Blaming just the republicans is missing the point. There are other lobbies at work here as well. Even the so called 'liberal' tech companies are pushing for it - http://www.broadcastingcable.com/news/washington/technet-pushes-senate-tax-bill/170381. Most of the people who pump money into politics are not going to say no to less taxes so they will happen. Even some Trumptards are disgusted by this crap. Way to go alienating your own base Donald! Lawmakers are not supposed to represent only a tiny majority. They're there for the greater good, supposedly. The reality is that they're in the pockets of the wealthy. The other reality is that some poor people are too stupid to see that and consistently vote against their own interests. Eejits. Sadly, I think the majority that voted for him are too ingrained in identity politics and will blame Obama/Dems/whomever other than GOP/Trump. Granted, once Trump is axed the GOP may well turn on him and give the base another scapegoat. Th can use our bodies to burn as fuel in their power plants. Win win. 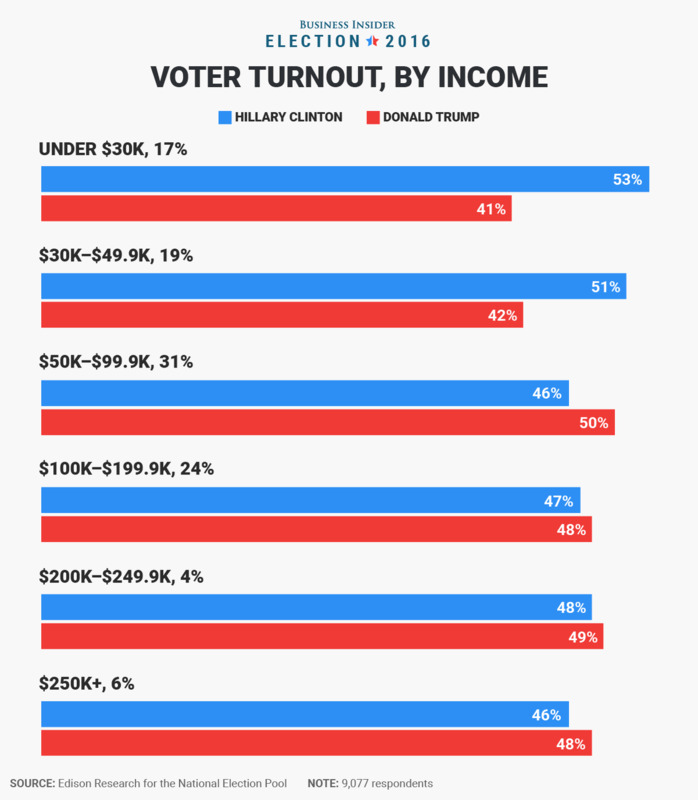 Under $30k represent around 50% of workers iirc but only 17% of voters. I guess that's the problem. Engels was the son of a factory owner who was banished to England because he was uninterested in the family business. He began writing about the conditions of workers in industrial Manchester and thus met Marx. Well yeah, but.. I don’t see Hayes rejecting his $1m+ contract any time soon. He is referring to a "crude" Marxist analysis, and IMO that would be: the owners of the means of production control society, in capitalist America that refers to people like the Waltons and the big CEOs (for example the CEO of Comcast, who is the boss of Hayes' boss' boss). The evidence that they control society (despite democracy) is the tax bill, the inefficient but profitable healthcare system, etc. How Hayes' salary comes into it I don't know. Edit: this graph is an explicit Marxist prediction which was proven false for the New Deal years but became accurate from the 70s onwards. I just think it’s funny seeing a millionaire bang on about Marxism. My sister just out about the new tax changes for PhD students. My GOP voting brother just found out about the dropping of student loan debt write offs yesterday... because I told him after he asked me what I thought. I then told him about how those with private jets might be getting a tax break but teachers (he’s one too) might be losing a tax write off for school supplies. Have you tried: I told you so? Or just recommend that he stops spending all his millions on booze and women. I've mentioned it earlier in the Trump thread, but there was a news cast some time ago where they interviewed a coal miner whose life literally depended on Obamacare as all his medication would be way too expensive for him to buy. He voted Trump anyway even though Obama practically saved his life with ACA. With this new tax reform his insurance will most likely disappear and he will either suffer terribly or more likely die. The mind boggles, it really does. That above chart says it all, really. While it's a minority, still 41-42% of people earning less than 50.000 voted for him. It's inexplicable.. Which year is she in? And which college? I find it difficult to have pity for that person. As @Carolina Red mentioned, we’re going to see lot of Trump voters blindsided by this tax bill. She's doing her PhD at Auburn. I've decided to drop the US program altogether. I have no idea if this is the right decision but I think at this point I can't really take the risk. Perhaps next year when the dust settles down and we have a clearer idea on how things will shape up. The problem is I now have to rethink what I want to study because European colleges are not offering my choice of program. PM if you need any specific help.